We are very excited about the launch of a new service - immigration and asylum appeal decisions. 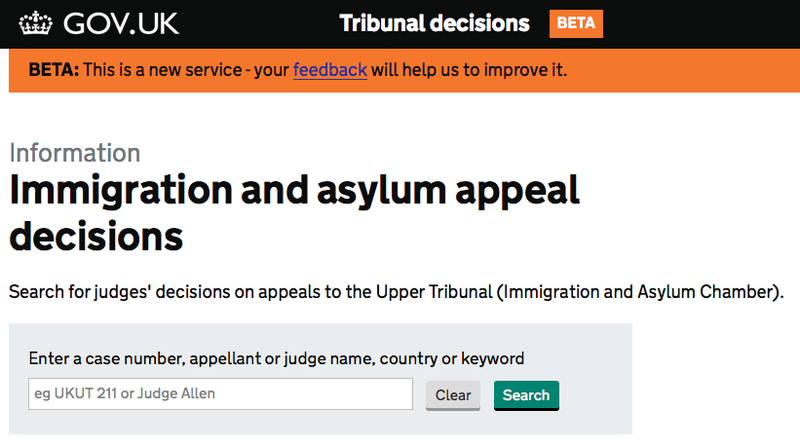 This allows you to find judges' decisions on immigration and asylum appeals, which have been decided by the Upper Tribunal Immigration and Asylum Chamber (UTIAC). We're excited not just because it's a really useful service, but also because it's the first open source project coming out of the Ministry of Justice and we were able to build it so quickly. The old database only allowed the user to search for certain decisions by the date of the decision, which could have been several months after the hearing, making it extremely hard to find the case in question. Our focus was therefore on the need to improve the search facility and to provide improved access to unreported decisions. We worked with colleagues in the UTIAC President's office, Immigration and Asylum Legal and Research Unit, HM Courts & Tribunals Service and judges at UTIAC to take forward this work. For the first time, you can search not only 'reported' decisions - important test cases - but also 'unreported' decisions - all the others, which make up 96% of the cases. 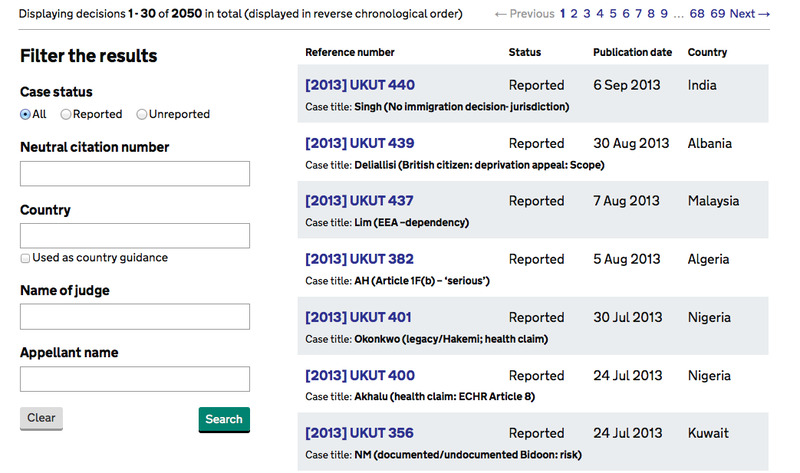 The new website includes all of the 'reported' decisions by the tribunal and the 'unreported' ones after 1 June 2013 (those prior to that date can be accessed on request). True to our goal for open government we have open-sourced the code on GitHub. Jump on and help us make it better! As with all of our services, this is a work in progress, and we'll be constantly improving it as we go along. We'd love to hear your thoughts so please do not hesitate to send them to us here or via the feedback form on the website. We are nearing the end of the discovery ('research') phase for these tribunals and will share proposed designs soon. Suggest ignoring brackets for search so that 2013 UKUT 440 finds  UKUT 440. Strictly I think the neutral citation includes the suffix (IAC). And RSS feed would be good of course. This is a huge improvement, thanks. How do we request unreported decisions prior to 1 June 2013, and does this mean that those old unreported cases are not in fact searchable as such? You can request unreported decisions prior to 1 June 2013 by contacting the email supplied on the tribunals decision search page. Older unreported decisions are searchable but need to be anonymised where needed before Immigration and the Asylum Legal and Research Unit can share them. Hope that helps. Looks great Daniel! How long before this digital revolution is rolled out to the whole of HM's court and tribunal service? This web service is only one of many tools and transactions being developed by the Digital Services Division, which should transform the way we deliver information and services to our customers. We will be making further announcements on work coming out of the MOJ and its agencies including HMCTS so watch this space. So we must rely on charity? Sounds a bit C19 to me. People already have to rely on BAILII. And if charity is willing to support something, I don't see why the state should then come in and make us all pay for it.